Teacher Appreciation Week will be here before you know it! 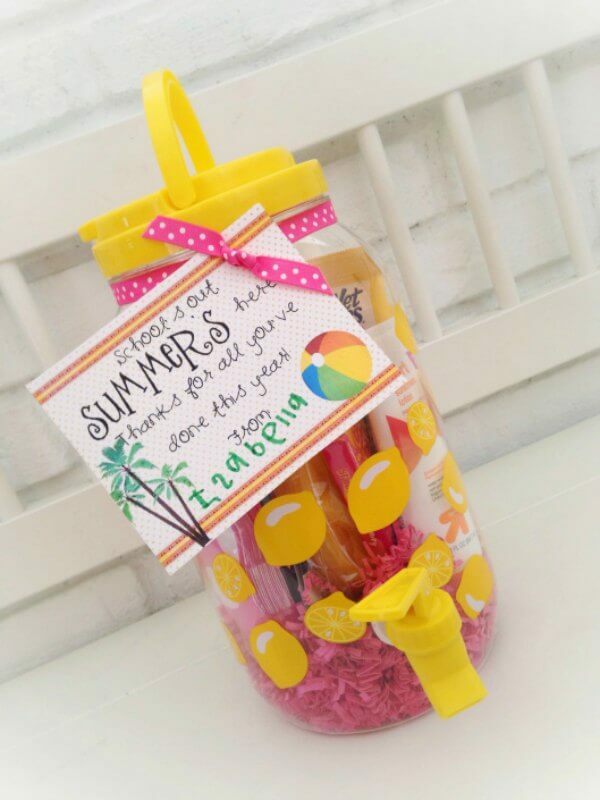 We have some creative Teacher Appreciation gift ideas that you can make. We have compiled several ideas for you to choose from, so hopefully this will give you a nice starting point. Let’s make our teachers feel loved and appreciated! 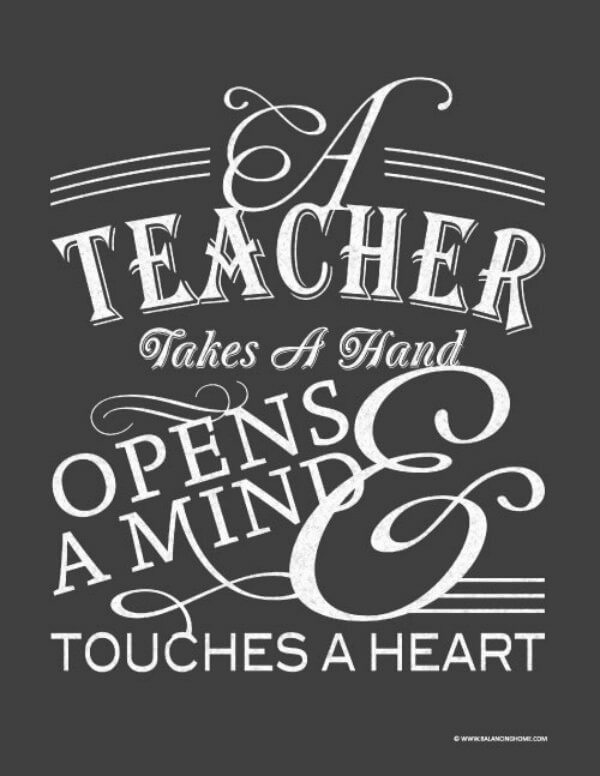 I would just like to send a thank you out to all of the great teachers that have chosen to use your gifts and talents to molding and teach our future generation. Teachers are awesome!! We have been blessed by wonderful teachers! If you love your teachers but just don’t know what to do for them next week, this post is for you. I always try to give each teacher a small Back to School Teacher Gift and another thoughtful gift during Teacher Appreciation Week. 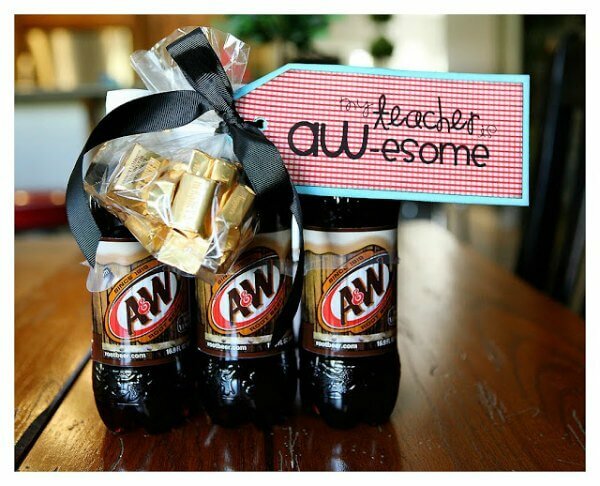 It can be hard to know what to give teachers for teacher appreciation day. Hopefully this list of the best teacher appreciation gifts will help you with lots of ideas for nice gifts for teachers. 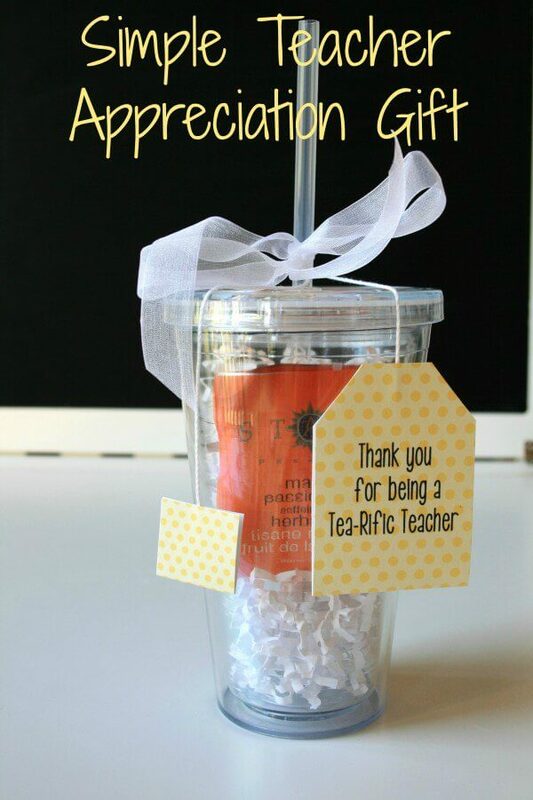 If you are looking for inexpensive teacher appreciation gifts, you have come to the right place! 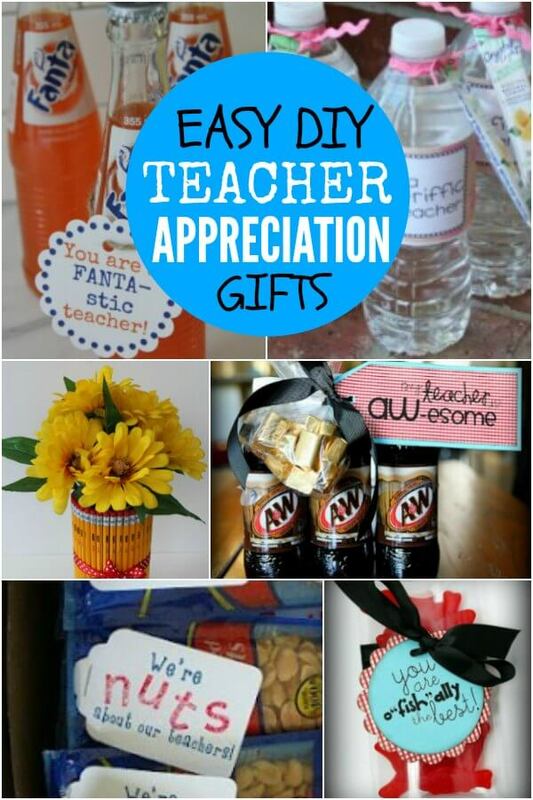 We have the best teacher appreciation gifts and lots of homemade teacher appreciation gifts. You will find lots of free gift tags, free printable tags and more for creative ideas. These ideas are really fun and useful. Plus, they do not cost a fortune or take forever to make. That’s a winner in my book! 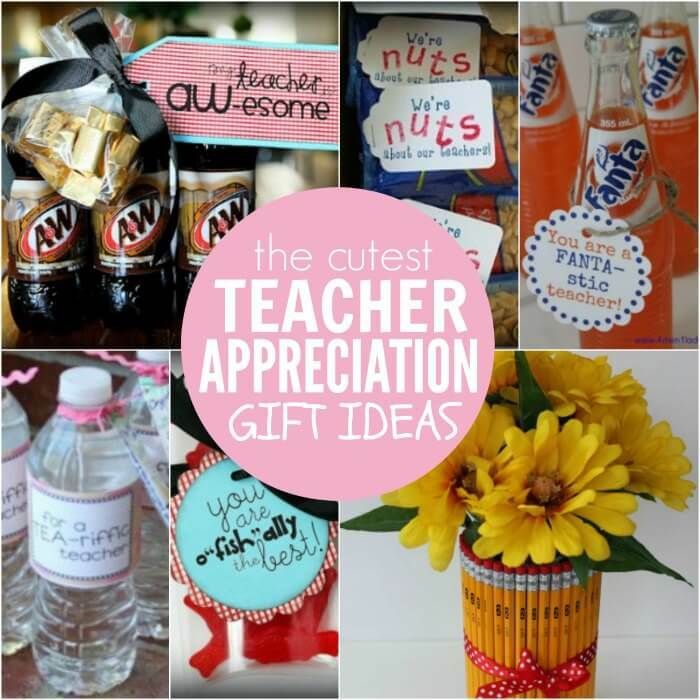 These Frugal Teacher Appreciation Gift Ideas are also thoughtful! Remember, you can use these ideas all year long – this year and next. While these gifts are frugal, they are also very thoughtful too. 🙂 Teachers will love receiving items they can use in the classroom for the rest of the year and next year! 1. My Teacher is “AW-esome”! Go here to find an easy printable template. Just add root beer! Yeah! 2. I just love brand new markers myself, and I am sure any teacher would too! There is a free printable that reads “Thank you for coloring our lives and making us Sharpies” from Design, Wash, Rinse Repeat. You can also get sharpies on Amazon all the time on sale. 3. Thank you for Making us Smarties. We just love this and we made it for under $4 from the dollar store! 5. You deserve chocolate!! Thanks for all you do! This is from the same sight as above. 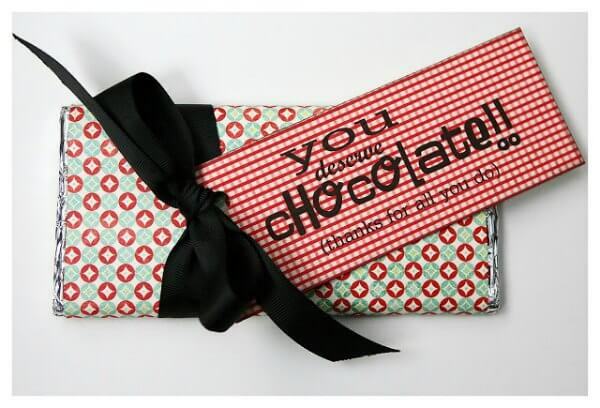 All you have to do is add your teacher’s favorite chocolate bar. I’m thinking cookies ‘n cream might be pretty tasty! Just choose whatever they like best and it’s sure to be a hit. 6. 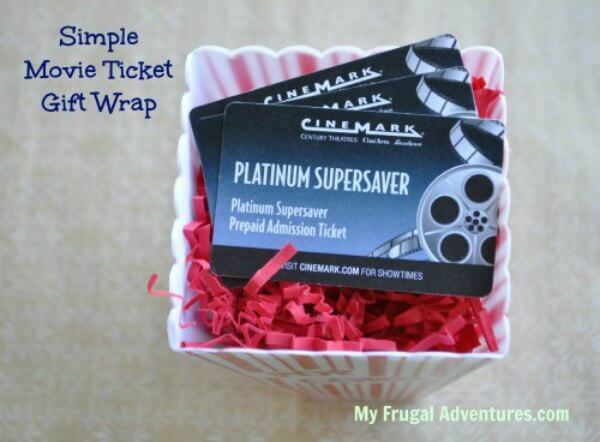 If your teacher like movies, you can give them some movies tickets or a gift card to to Redbox. Here is a really and inexpensive way to package up that gift. You can add popcorn too! 7. 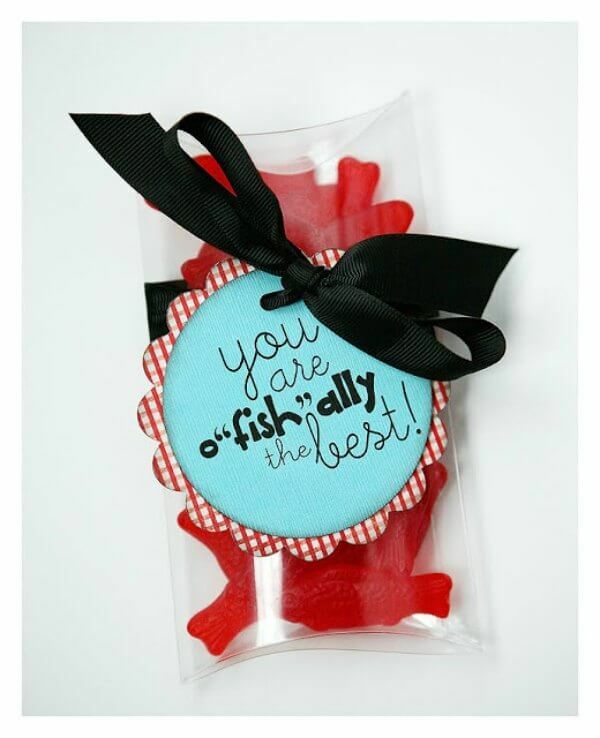 You are o”fish”ally the best! Again, this is from the blog eighteen25. They have the template all set up for you, making this a super easy gift. All you have to do is add swedish fish or even some goldfish. The rainbow goldfish looks really pretty. 8. Here is a free 8×10 printable from Balancing Home. You might consider framing this or print it on cardstock and place inside a clipboard. I love the clipboard idea. 9. You’re the star of our class. 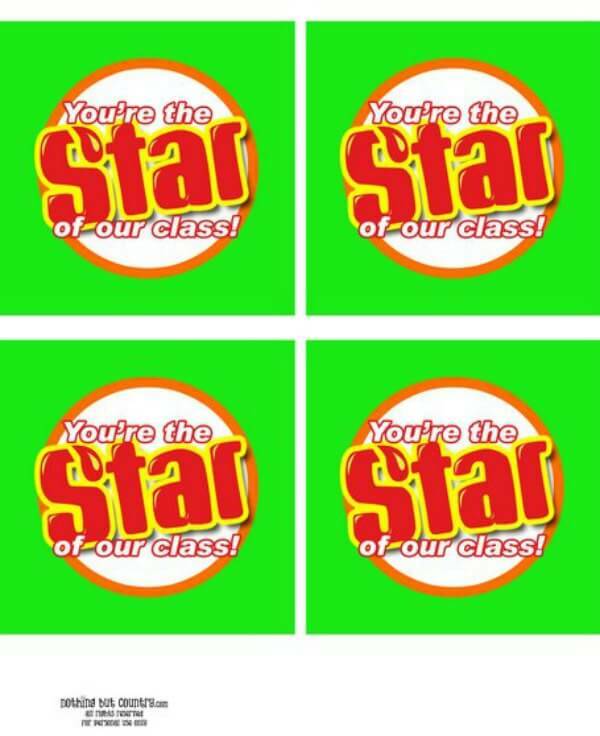 This picture says star of the family, but nothing but country has a template for star of the class, perfect for teacher appreciation! 10. 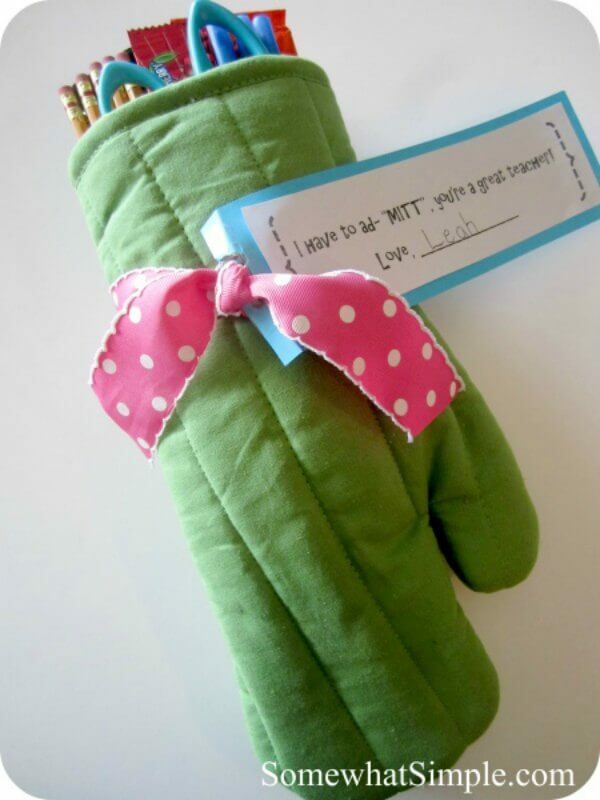 Fill an oven mitt with the treats, add a tag with some ribbon for a really cute gift idea. Check it out here. They have really cute botanical garden oven mitts here. 11. Thanks for making me a sharpie. Print this cute template and add a marker! Easy and cute. 13. Thanks a latte! Is your teacher a coffee drinker? 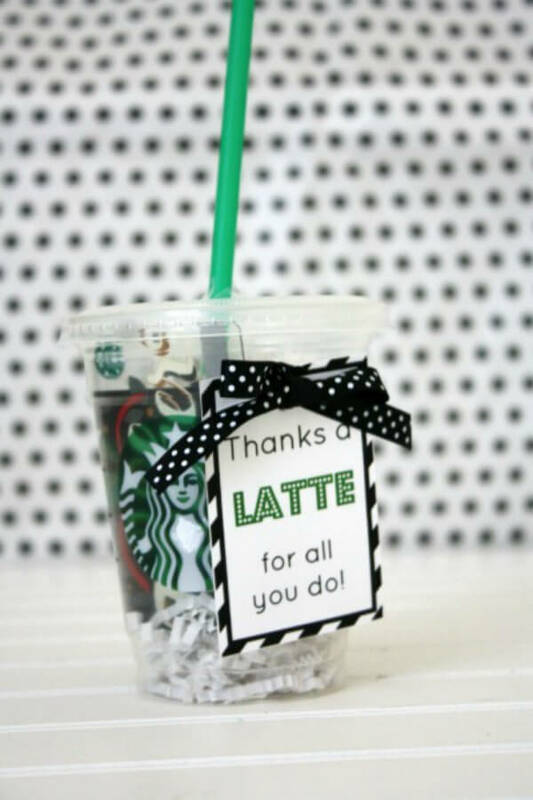 Here is a great idea from Life Anchored for jazzing up a Starbucks gift card. Teachers will love getting a Starbucks gift card. 14. 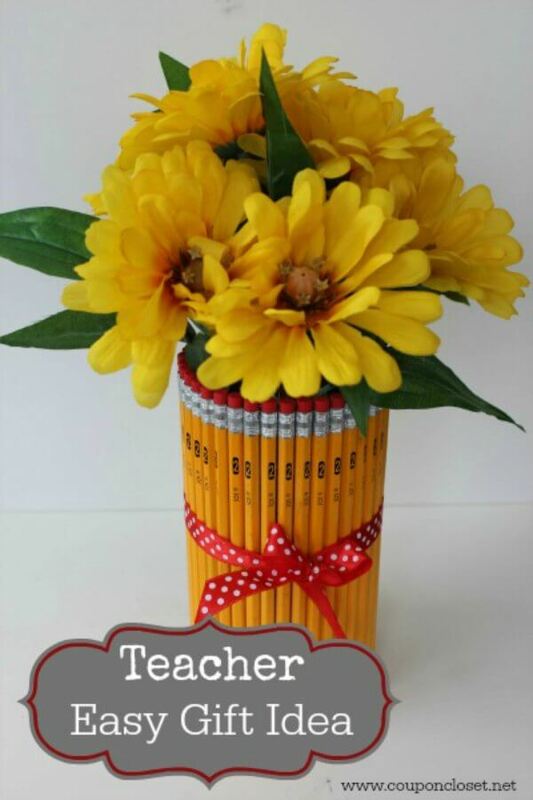 Easy Pencil vase with flowers– Cost less than $5 to make! 15. 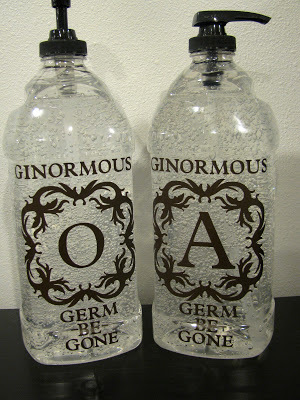 I love this idea of giving your teacher a HUGE bottle of purell and jazzing it up and personalizing it. Grab a huge bottle of purell and make this fun and useful gift! 17. Bargain Shopping Mom has another version of a TEA-riffic gift idea. Check it out here. 18. Apples alone are not enough, teachers need hugs too! 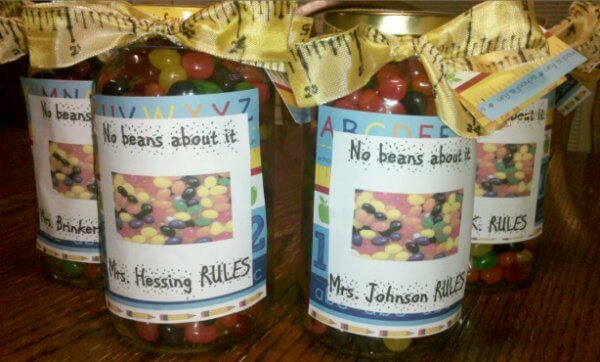 What a sweet idea for your teacher! There is no template, but it would be super easy to replicate. 19. You’re the ‘hi-lite’ of my day! Practical and cute. My favorite! Just attach this cute tag to a highlighter (or two). I like to get a big box on Amazon when they go on sale. 20. 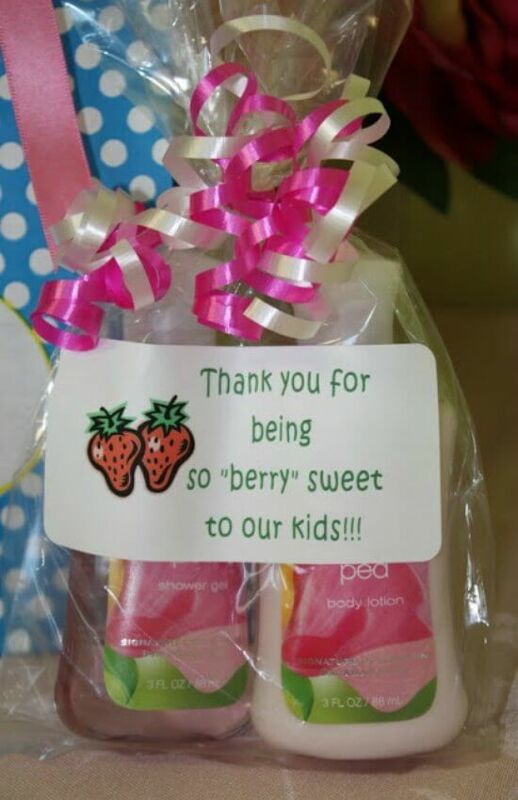 Check out DIY Florida Mom’s post on her End of theyear Teacher’s Gift. She filled up a plastic Beverage Dispenser and it looks great! She used a plastic drink dispenser but glass would work too. It would just be heavier to carry so keep that in mind. 21. 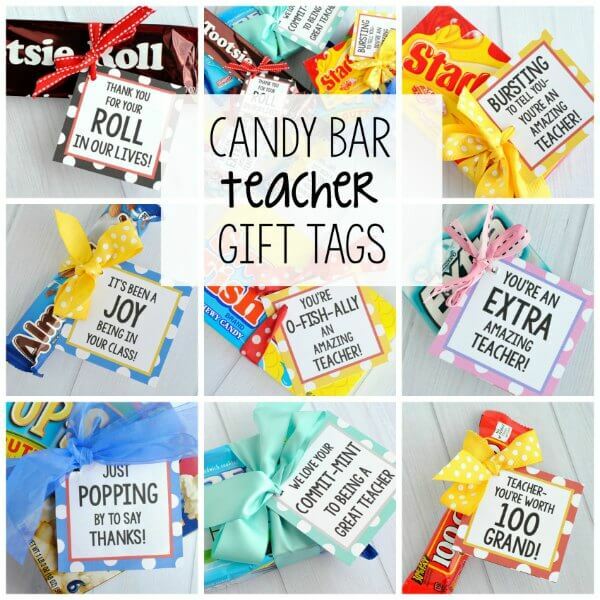 Teacher Appreciation Candy Bar Tags from Fun Squared. There is something for all sorts of candy! 22. 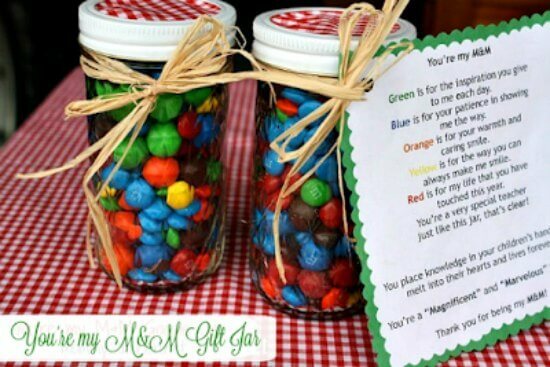 Check out this cute M&M poem for your teacher! I love it! 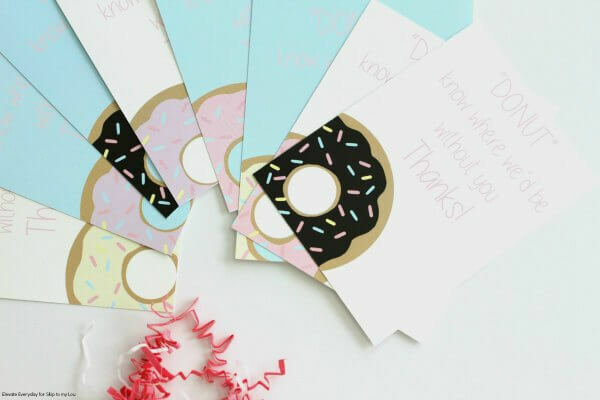 Attach this cute printable for a sweet gift! 23. 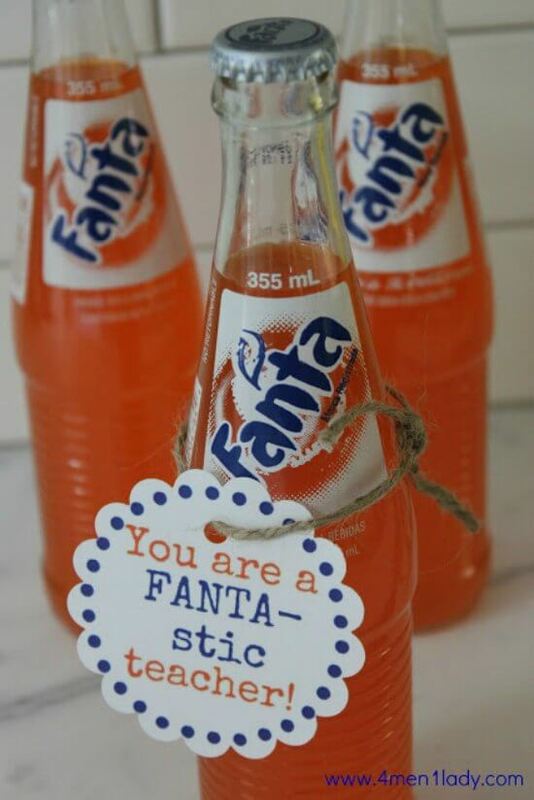 I love this gift idea using Fanta – Check it out here. 24. 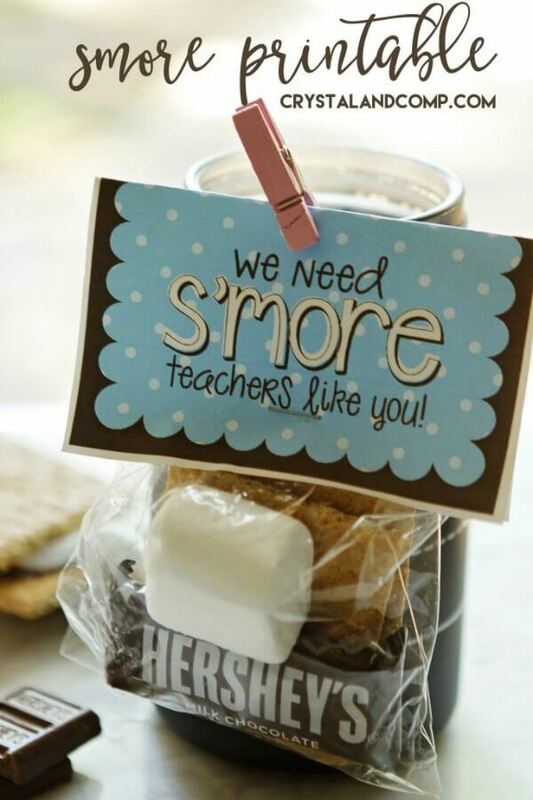 We Need Smore Teachers Like You Printable– give your teacher this delicious smore treat! Love this printable. Plus, it’s a delicious treat! Everyone loves to eat s’mores. 25. 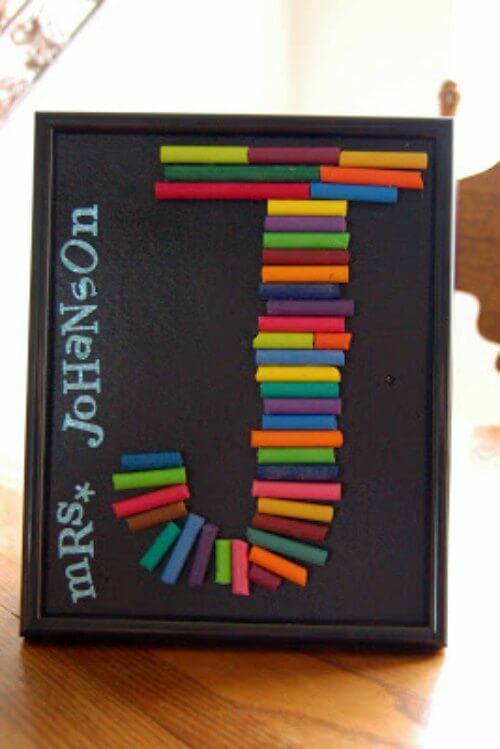 Make your teacher this fun artwork made out of crayons. You can buy everything at Dollar Tree! They have great school supplies for a teacher thank you gift! This is such a cute gift. This idea would work for lots of other holidays and celebrations too. Which one of these simple and cheap teacher appreciation gifts are you going to try? Do you have any ideas? I’d love to hear them. Leave a comment and let us know what you do to tell your Teacher’s you appreciate them! 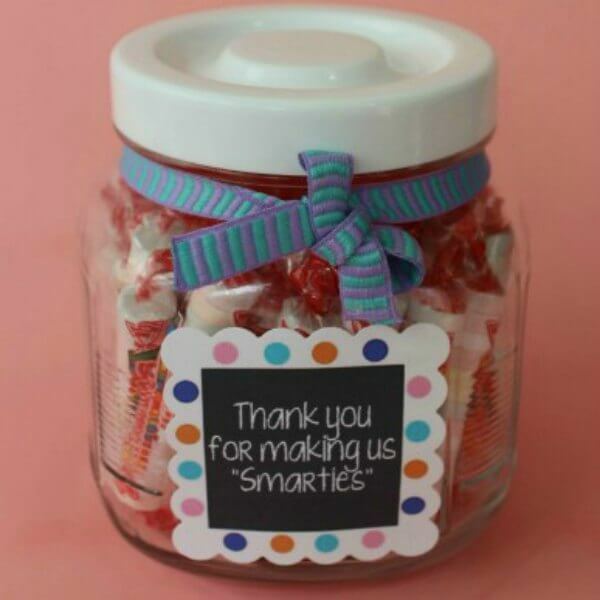 What teacher thank you gift will you try to make? 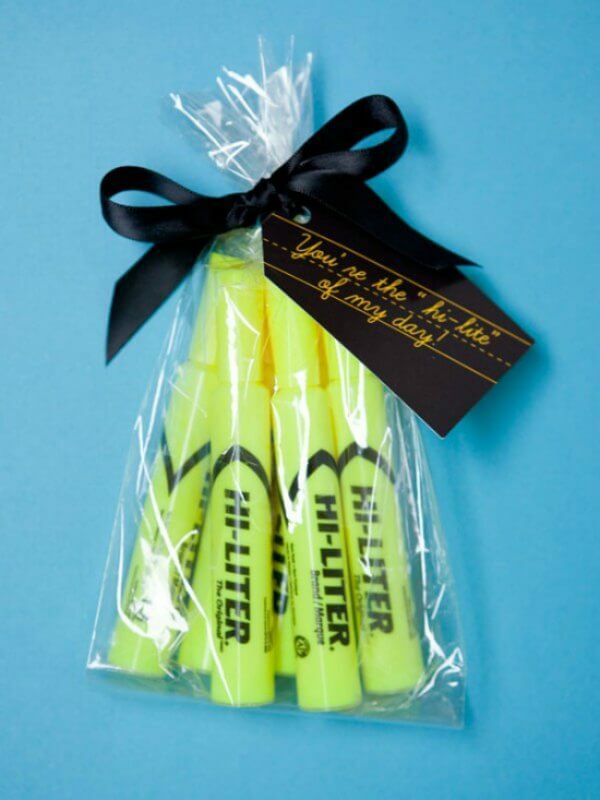 We love fun teacher appreciation ideas. Please share if you have a great idea! You don’t have to spend a lot of money to make your teacher feel loved and appreciated! It’s the thought that counts. I love that these gifts are useful and practical. They include lots of things that your teacher can use all year and the next year. Teachers will love getting these items! Do you have a favorite idea that you give each year? A tried and true gift that you like or do you switch it up yearly? We love new ideas! You can also get back to school teacher gift ideas. Just a little something to let teachers know you care can really go a long way!